Not just another cheap roadside attraction! 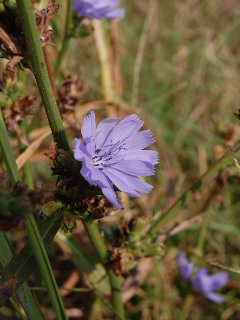 No—the widely occurring chicory plant, with its humble but beautiful blue blossoms, is actually a great example of useful herbal flora that boasts medicinal and culinary functionality. The leaves of the chicory plant are sometimes picked and mixed into salads or other dishes—the plant producing larger broader leaves near the bottom of the stem and smaller leaves closer to the top. The bitter taste of the wild leaves is lessened somewhat by boiling the leaves, discarding the water, and then seasoning the cooked leaves with other herbs. The ingestion of chicory is believed to aid in digestion and overall bowel function and to assist in liver function and cleansing of the system. One of the most popular uses of the chicory plant is in the utilization of the roots of the mature plants as an addition to or as a substitution for coffee. The chicory roots are harvested, dried, roasted, and ground into a consistency very similar to ground coffee beans. The beverage is then brewed and consumed in the same manner as traditional coffee. One distinctive difference between the chicory root beverage and pure coffee is that chicory is naturally decaffeinated, making this characteristic either a plus or a minus—depending on the effect desired by the drinker. It is believed that this method of using the chicory roots as a coffee substitute/addition has been practiced virtually everywhere the plant naturally occurs and for as long as the plant has been recognized. This chicory root beverage has been especially important in areas where coffee has been hard to come by because of economic circumstances, shipping and trade blockades, or the unavailability of coffee beans in certain geographic areas. 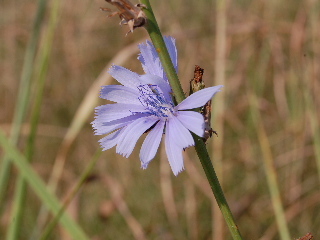 Wild growing chicory is a plant that occurs naturally throughout many parts of Europe and North America, often found in plentiful abundance along roadways. This, in fact, was my earliest awareness of the plant—as a stalky little common wildflower about 2 or 3 feet in height growing happily and naturally along the rural highways of eastern Tennessee. As a child, I had no awareness of its dietary usefulness. To me, it was indeed just another of Nature’s scenic gifts—a wildflower by the wayside. For those who want to add chicory to their garden, either for the subdued beauty of the classic small blue flowers or for the utilization of the roots and leaves as consumable food products, chicory seeds can be purchased online or from gardening supply stores.